A Cornish commercial agent is inviting offers from potential purchasers keen to get their hands on their very own copper mine. Tywarnhale Mine, near Pothtowan, is a former 19th Century copper mine which comes with a number of mine buildings. The land, which stretches to 42 acres, is designated as a site of special scientific interest. Offers over £100,000 are being sought for the site which is unlikely to gain permission to be turned into a home. Peter Heather, of Truro-based Miller Commercial, said: "It is not often we have the opportunity to offer such historic and interesting property. "As to its future we do know that informal discussions with the local authority indicates a desire to see the surface buildings used for commercial purposes and there is a resistance towards a change of use to residential." 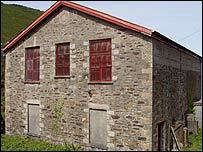 The property currently forms part of Cornwall's application as a World Heritage Site for Cornish Mining and some of the buildings are Grade II listed.